Discover the most popular Dragon Collecting game in the world! Can you hatch them all? 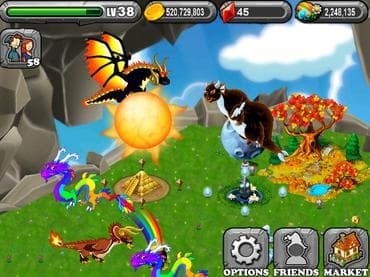 Your Dragon-filled destiny awaits in DragonVale! Breed and raise 250+ different dragons. Match, hatch, and show off your stash! Build and decorate beautiful floating islands in the sky to create your ultimate park. Impress your family and friends by displaying your park and sharing your favorite dragons for cooperative breeding! Spectacular visuals and sparkling animations accompanied by an original soundtrack. Если у Вас есть вопросы, связанные с игрой Dragon Vale пожалуйста используйте эту форму для связи с нами.